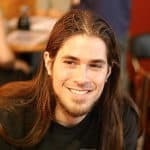 I know this might seem like an odd topic for a team of beer geeks, but there is something intriguing about making wine. Of course, it would be great if you could just turn water into wine, or even beer, but half the fun of beer or wine is actually the work involved in making it. We get asked how to make wine quite often. In some cases, this question is followed by rather funny stories of using beer-making kits and just replacing grain with grapes. It’s not something we would recommend unless you’re a bit of a science geek who likes to see experiments go wrong. 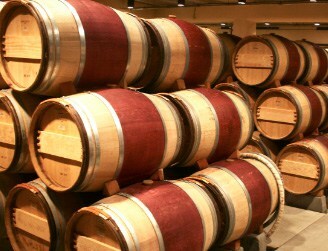 While the overall idea is very similar, the process of home wine making is different. And you will certainly need a different type of equipment and ingredients. So, to help you make preparations and plans for a nice batch of homemade wine, we decided to put together an easy to follow guide. Squeeze and crush the grapes by hand. Store the crushed grape and remove the peel (aka the hat) twice a day. Measure the tartaric acidity of the juice. Also measure and adjust the sugar content. Separate the heavy pulp and the remaining peel. Pour the remaining liquid into a fermenting glass jug and add the yeast. 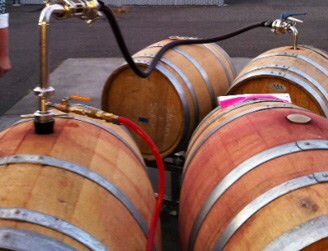 Once the Brix value is below 0.5°, start racking the wine to siphon off the sediment. Let the wine age for 1 to 12 months. 2 How Long Will It Take to Make Wine? 6 What Equipment & Ingredients Do You Need? The temptation is always to jump in and buy some gear and just get going. If you’ve brewed beer before, then the wine making process may not seem all that alien to you. But there are huge differences in both the planning and execution. 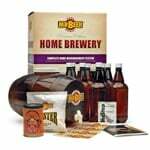 For starters, you can put on a batch of beer and have a very enjoyable brew in just a couple of weeks. Wine is very different in this regard. So, before you fill your garage or man shed with even more gear, just take the time to get some planning done first. How Long Will It Take to Make Wine? For most people, this question turns into: How long will it take before I can taste the fruits of my labor? is after about 3 to 4 weeks. But this doesn’t account for aging, which is more important for red wine than white. If you really want to enjoy your wine, then you should consider aging it in bottles for at least a month. Best results will come after about 6 to 12 months though. Yes, it will take some patience, but it will make a huge difference. 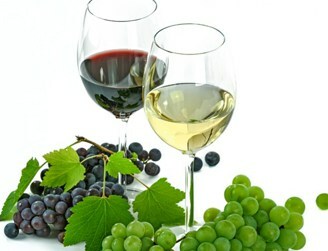 Most people think that the only difference is down to the grapes being used, with red generally using a much darker variety that is richer in pigmentation. But the processing of the grapes is also quite a bit different. For white wine, the fruit is crushed, and then all the pulp and skin is immediately removed. All you’re left with is the juice. 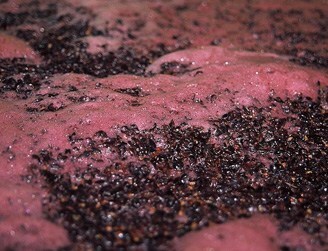 For red, on the other hand, the grapes are crushed, and fermentation is kicked off while the juice and pulp are still being combined. The peel and pulp are only gradually removed, which results in a lot more of the dark pigmentation being released. 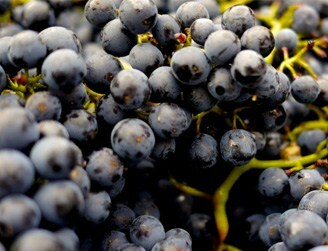 For this guide, we will be focusing on making red wine. Simply because after a vote in the office there were more red than white wine drinkers. We will at some stage get around to making some white wine as well and will share that guide with you too. Let’s take a look at some other things to consider before getting started. Unlike beer making that involves boiling the mash, making wine at home requires far less heat. The crushed fruit releases sugar very easily, and fermentation will start in less than a day of storage just above room temperature (about 70 °F). But the end result will be a rather disgusting beverage, only suitable for unwanted visitors. vintage being used with wine. Every bottle you buy will have a year printed on it which indicates when the grapes were harvested and processed. Cheaper wines will generally be a year or two old, and they will already be perfectly enjoyable. 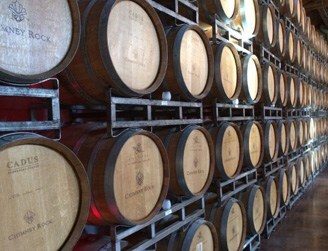 But to really get the best out of wine, it has to age in a cool and dark place. By letting the wine sit like this, it will change in color, flavor, and aroma. The main thing that happens when you let wine age like this is that tannins that are contained in the skin will break down further. “You experience the effect of tannins any time you drink a wine that creates a drying sensation in your mouth.” – Vine Pair. 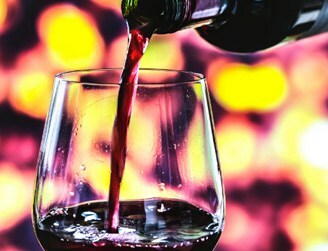 However, tannins have quite a bitter taste to them and leave a dry feeling in your mouth that isn’t all that pleasant. 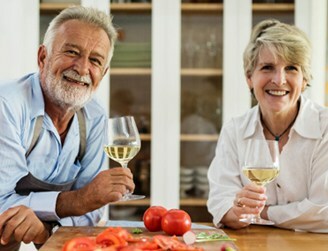 So, if you really want to enjoy your homemade wine, then plan to let it age for a while. Are you ready for your first batch? Then let’s start off with the right equipment. What Equipment & Ingredients Do You Need? There is definitely a temptation to buy a simple kit and a couple of ingredients and just go for it. How hard could it be, right? Especially if you’ve already brewed beer before, then it should be easy! Unfortunately, there are significant differences in both the equipment and ingredients. There might be a few things that you already have, but it’s very important that you have all the necessary stuff before you get started. Wine making equipment is a bit different to what is used in brewing beer. The concepts are similar but don’t rely on being able to use all your existing gear. Now you could just go to your local grocery store and buy a few boxes of grapes. It certainly will work, but the results will be very unpredictable. 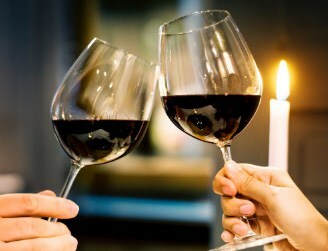 You’re more likely to end up with a pretty bad batch of wine. The average grape variety sold in a supermarket may taste fine to eat, but that doesn’t mean it’s suitable for making wine. Also, you have no control over when the grapes are picked. There is a very small window when winemakers pick their crops. Generally, it has to be in dry weather after at least 2 to 3 days without rain. Grapes that are picked for supermarkets are picked on a schedule that doesn’t consider that someone might want to make wine. The best thing you can do is find a vineyard near you where you can go and pick your own. Or if you’re really adventurous, then you could try your hand at growing your own. In both these situations, you have total control over the quality of the berries. As for what variety of grapes you use, that is entirely up to you. If you have a favorite type, maybe Merlot, Cabernet Sauvignon or Shiraz, then try to source that variety. Or you can create your very own blend. Once you have gathered all the above equipment and ingredients you’re ready to start making your first ever wine making adventure. First of all, you have to prepare the equipment to make sure it’s sanitized. Even if you fully clean kit after every use, some harmful bacteria can still get in there if it has been in storage for a while. So, before you do anything, get out some clean sponges and sanitizing wipes, and make sure you use plenty of elbow grease. Get into the corners to make sure you don’t leave anything to chance and that everything is fully sanitized. 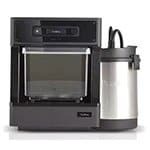 Read the full review on the best brewing sanitizers & cleaners. sourcing of the grapes and the timing of the picking. If you can get fresh grapes locally, that’s the best solution. Alternatively, there are some specialty fruit and veg stores that might be able to help. As a rough guide, you should aim for 20 pounds of grapes per gallon batch of wine that you want to make. Make sure they are squeezed and crushed to a pulp, but avoid using metal devices to crush and store them. You have to avoid breaking up any seeds which can create a very bitter flavor. The best thing you can do is get your hands dirty, and have some messy fun by smashing them up by hand. It’s a lot more fun than you might think it is. Unlike beer making, you won’t have to boil the grape juice and pulp (called must) before fermentation. In step 2 you ended up with crushed grapes, and ideally, you want to store them in the same pot or plastic bucket. 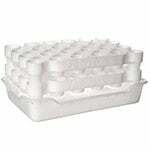 This should be a food-grade container, with synthetic plastic materials being more suitable because you avoid the risk of oxidation, which would happen if the juice comes into contact with a metal container. Place a clean cloth over the bucket and leave it to stand for 3 to 4 days in a dark and warm space at about 70 °F. After about 18 hours the primary fermentation process will start, and at this stage, you will notice that the peels will start rising to the top. Remove this peel, called the hat, about twice a day, but try to avoid removing the pulp. This involves two steps that are vital to making your wine more enjoyable. First of all, you want to use a titration kit which measures the tartaric acidity of the juice. 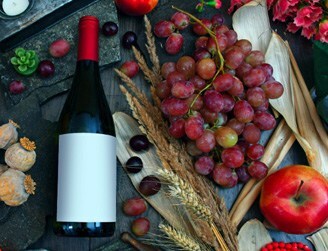 For a dry red, you need to aim for an acidity of 6 to 7 grams per liter. In pretty much all cases you will measure below this level. For every gram you measure too low you will need to add 1 gram of tartaric acid to your must. It’s actually very simple math. Just make sure you do this gradually, measuring the must each time you add a little. The second thing you will need to measure and adjust is the sugar content. For this, you’ll need a hydrometer which gives you a so-called Brix measurement. This tells you how much sugar is in the juice, which provides a way to estimate the alcohol percent after fermentation. Aim for a Brix of 22°, which will give you decent enough alcohol content of 13% ABV. If you’re below that value, then you can dissolve a little bit of sugar in lukewarm water and add it to the must. Just make sure you do this gradually. You also want to keep note of your measurements so that you can ultimately come up with your own recipes. As you taste a batch, you’ll be able to tell which combinations worked best. At this stage, the wine is nowhere near fully fermented, but you should hear a hissing sound after about three days. Then it’s time to get a bit messy again and separate all the heavy pulp and the remaining peel. Place the cheesecloth over a second container and slowly pour the must over the cloth. Peel, pulp, and sediment will be filtered out, and the final step will be to squeeze the remaining juice out of the cloth. It’s now time to prepare for the active fermenting stage. 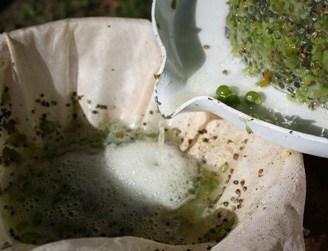 With the peel and pulp discarded, you can pour the remaining liquid into a fermenting glass jug. Make sure you also have an airlock placed on top to stop air influx that would turn the batch sour. Some people just use a rubber glove with a small hole in one finger. Works just fine, but you can also get a rubber stopper with a valve for just a few dollars. Now for the really important part: Don’t forget to add the yeast! For every gallon, you should use 2 grams of yeast. Add it to a pint of warm water and wait for about 10 minutes until it starts bubbling. Then add the yeast nutrient and pour the lot into the jug. This is where the magic of nature takes over, and sugar is processed into alcohol. It’s as wonderful in wine making, as with brewing beer. After about three weeks, the fermentation process will finish once all the sugar has been processed. During this stage you want to make sure that you check the airlock regularly for signs that CO2 is still escaping. If it stops too soon, then you may need to reactivate the yeast. Use your hydrometer to check the Brix value again. Once it is below 0.5°, it’s time to start racking to siphon off the sediment. Before you do this, however, there is one step we recommend doing to avoid spoilage. By adding potassium metabisulfite and potassium sorbate into the fermentation container, you will stop the yeast from reproducing and any mold from developing. This will also halt any further fermentation if you wanted to add some sugar or other fruit to sweeten and flavor the wine. 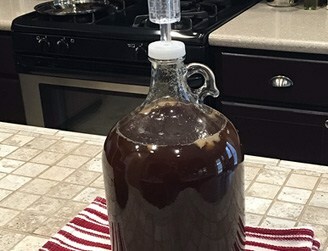 Once this is done, you will use a sanitized hose pipe and slowly siphon the liquid into a second glass jug, avoiding the sediment at the bottom. Fill the second jug with cool boiled water and place the airlock on top. Repeat this process after about a week again. The unfortunate reality of wine making is that you should always age your end product for 1 to 12 months. This will require some patience, but if you’re a bit disappointed after tasting your fresh batch, then don’t be rejected. 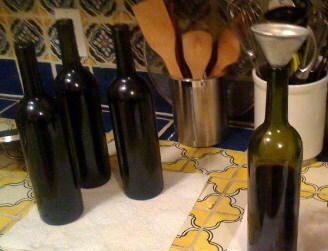 You will be rewarded in a few months’ time when you open your first homemade wine bottle. Maybe you’ll even share a glass with a friend or loved one, but there would be nothing wrong with keeping it all to yourself. After the wine has aged for your chosen duration, it’s time to rack it one more time (see step 7), before you move on to the final step. 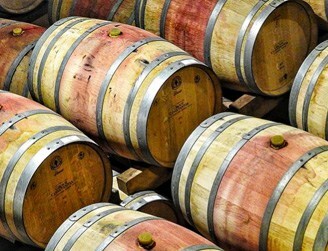 A US gallon is 3.79 liters, which is about five standard wine bottles. You can use some that you opened before, or buy new ones. 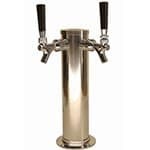 Just make sure they are fully cleaned and sanitized before bottling your own creation. 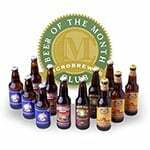 You will also need new corks, and rubber ones are the easiest to source for bottling. However, they are the most difficult to get in, so you will need a corking tool as well. They can be expensive, but for a DIY setup, one of the simpler ones will be more than enough. And that’s it. You can go ahead and let the bottles sit for another few months, but in most cases, homemade wine won’t benefit from aging beyond 12 months. Home wine making is a lot of fun especially once you get to taste the end result. 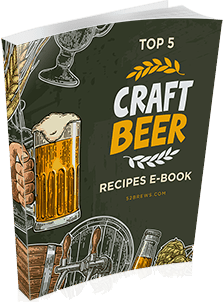 It’s very different from beer brewing, and you should certainly not underestimate how much manual work goes into it. But with the above guide and some entry level kits you’ll be creating your own vintages in no time. 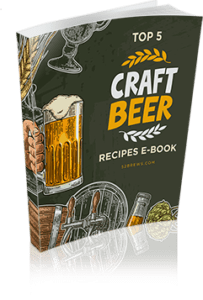 As you create different batches, you’ll soon learn to adjust your recipes, and once you have one that suits your taste, you can increase production and fill up your pantry with dozens of bottles of wine. At least that’s what I’m doing. We should also mention that the above guide can also be used to make fruit wines using plums, pineapple, and even pomegranate. This is a great way to bridge those months when it’s a bit more difficult to get your hands on the perfect grapes. Hope you enjoyed this read. Now go ahead and get those bottles of wine ready!